Last week, we shared exciting news with our Preschool families: next year, the Pre-K4 program will be hosted at the Lower School. This move opens a lot of new opportunities for our Pre-K4s as they prepare to enter Kindergarten, first among them enhanced enrichment opportunities in STEM, art, music, Spanish, and PE, but also expanded facilities for those classes, and all of the after-school programming of Cougar Hour. Next year, our Mother's Morning Out, Pre-K2, and Pre-K3 classes will remain at the current Preschool site on the ground floor of Holy Spirit Catholic Church. There, we can focus more closely on meeting their personal developmental needs and on growing these classes into a robust early childhood program. I want to congratulate our 2018-19 Head Boy and Head Girl, Conner McKittrick and Elizabeth Perez. They were named as next year's leaders of the student body at our May Crowning ceremonies. Elizabeth has been here since she was just in Kindergarten, and Conner enrolled in second grade. The spirit of service they embody in church, in the classroom, and on the field is exactly the spirit of servant leadership we seek to form in all of our students. I am very proud of them, and all of this year's candidates for Head Boy and Girl, who demonstrate the best of our program of formation. Kudos also goes to this year's valedictorian and salutatorian, David Sullivan and Maddie Hardt. Among the talented seniors of the Class of 2018, their academic achievements stand out. It is no surprise to me that they have been at HSP virtually their entire academic careers, and that they both have extensive credits in classics courses. I look forward to hearing their speeches at this year's graduation ceremonies. 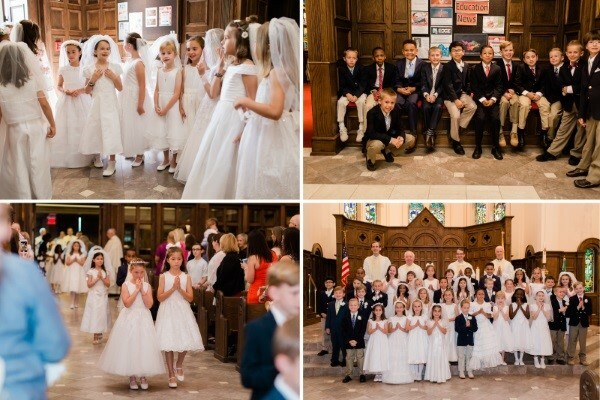 I also want to acknowledge our 2nd-graders, who just completed a year of sacramental preparation by receiving their First Holy Communion. It was a beautiful Mass, touched by sacramental grace, and it underscored the most important part of what we do here, aiming to form our students into saints. We saw a glimpse of that in our First Communicants this week. P.S. Last week, we celebrated the release of the Ingenium, which showcases the best work of our Upper School artists, both visual and literary. This year's volume contains some particularly outstanding work; it is a testament to the incredible talents of our students and the exceptional quality of their teachers. We are proud to announce the valedictorian and salutatorian of the Class of 2018, and the guest speaker for this year's commencement exercises. David Sullivan is the valedictorian of the Class of 2018. A student at Holy Spirit Prep since Preschool, he is the starting goalkeeper on our varsity soccer team, an altar server, a member of the Liturgical Choir and of Delta Omega, the boys' service fraternity dedicated to anonymous acts of service on campus. He is President of the House of Lyon. David loves the classics. This semester, he completed his fourth year of Latin and his fifth year of Greek. He helped run Classics Club, teaching Lower School students the basics of Latin and Greek language and culture. He has won both the Delneo Cup and the Logos Bowl, the Upper School’s annual contests in theology and classics knowledge. 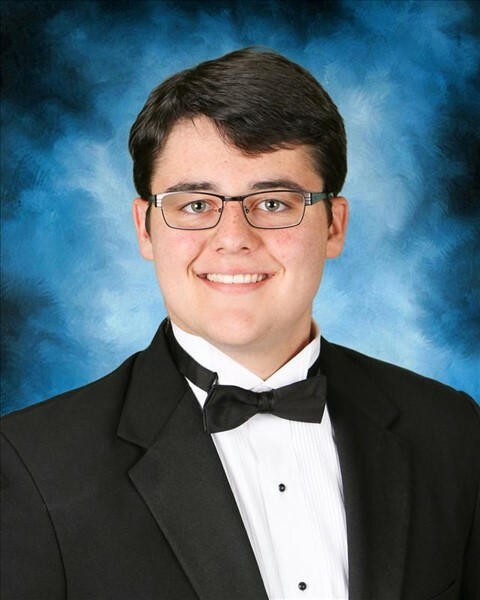 David fielded many college offers, including acceptances at Brown University, the University of Notre Dame, and full-ride offers to Furman University and the University of Alabama. This fall, David will attend the honors program at the University of Georgia. 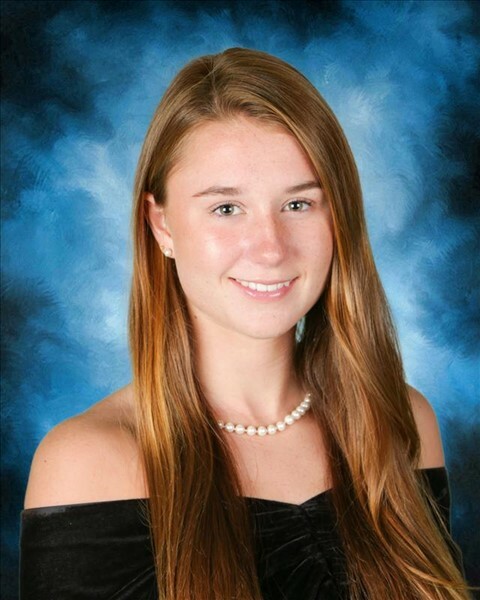 Madeleine Hardt is the salutatorian of the Class of 2018. She has attended HSP since 4th grade. Maddie is the president of the Marine Biology club and the vice-president of Alpha Phi, the girls' sorority dedicated to service. She is a varsity soccer and volleyball player, an Elite Altar Server, and a member of St. Joseph's Cohort, the National Honor Society, and the National Latin Honor Society. Maddie is the president of girlFriends, an organization of high-school girls dedicated to fundraising for Children's Healthcare of Atlanta. She holds numerous certification in scuba diving. Maddie fielded offers from a number of colleges - Northeastern University, Tulane University, Furman University, and the University of Alabama, among others. This fall, Maddie will attend the Georgia Institute of Technology as a Stamps Scholar, the highest scholarship program Georgia Tech offers. Joseph Pearce is an accomplished tutor, teacher, public speaker, and television host, and the former writer-in-residence and professor of literature at Ave Maria University. As a young man, Mr. Pearce was aligned with extremist, nationalist politics - but in 1989, Mr. Pearce experienced a profound conversion to Catholicism, repudiating his former ideology and embracing the Church. Since his conversion, Mr. Pearce has written bestselling books on G. K. Chesterton, C. S. Lewis, Hilaire Belloc, J. R.R. Tolkien, Shakespeare, and others. He has authored more than a dozen books, all of which correspond to the Catholic intellectual tradition while exploring the vivacity of a life of Faith. He is the host of EWTN's The Quest for Shakespeare, based on his book The Quest for Shakespeare: The Bard of Avon and the Church of Rome. On Friday, May 4, the class of 2018 participated in the Pennant Ceremony, hanging pennants in the Upper School library representing their college destinations next year. The 45 students in the graduating class have received 144 acceptances to 110 colleges and at least $2.7 million in scholarship offers. Our students have again proven competitive among all types of universities: From Ivy League universities and Catholic colleges to small liberal arts colleges and large public research universities. Senior David Sullivan had a list of college offers to consider. His final choice came down to a full-ride, National Merit scholarship to the honors program at the University of Alabama; the James B. Duke Scholarship (a full-tuition scholarship) to Furman University; the Charles McDonald Brown scholarship ($5,000 per year) plus the Zell Miller Scholarship (full-tuition) to the honors program at UGA; a Notre Dame honors program admission offer; and an Ivy league offer from Brown University. After much introspection, visits to each of the campuses, and a strong sense of practicality, he chose UGA for the great value, strong classics program, good football, and proximity to home. David intends to go on to graduate school in his study of the classics and knew that UGA would give him the opportunities he needed to have sure footing after undergrad. HSP will send six athletes to compete at the college level next year! The Offices of College Counseling and Athletics have worked closely this year to prepare student athletes in 9th-12th grade for the recruitment process, and we’ve certainly seen the fruits of that in this year’s graduates. Our students will spread out to play across the three NCAA divisions. Kamani Johnson and Georgii Maslennikov will play basketball for University of Arkansas—Little Rock and Depaul, respectively. Two senior tennis players will play in college with Sabina Grigorian at Villanova University and Nelson Tyer Jones at Sewanee. In football, Ryan Harrison will travel to the Midwest to play for Iowa Wesleyan University, and in baseball, Vinny Antinori will play for Emmanuel College in Franklin Springs, GA.
Patrick Schulman and Sarah Durham have certainly made their marks on the Upper School campus this year. We expect their next steps will be just as successful and their college destinations will welcome their leadership with open arms. Patrick’s top choice going into the college admissions process was Georgia Tech, and he was thrilled to receive his offer of acceptance during the early action round. Sarah had college offers on both coasts from University of Rochester in New York to several of the University of California campuses on the west coast. She is excited to wear blue and yellow next year as a UCLA Bruin! 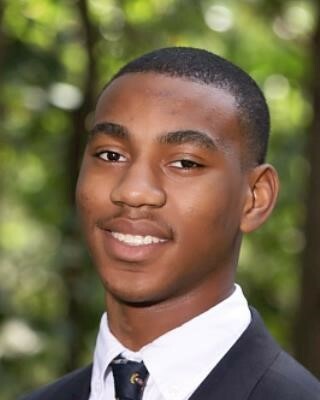 This year’s class also included a Stamps Scholar at Georgia Tech (the highest undergraduate scholarship the institution offers), a Posse Scholar Finalist, and a Five Strong Scholarship offer (a full-scholarship to a selected group of HBCUs). The Office of College Counseling works closely with our high school students and their families to find the best college fit for each student. They are available to you with any questions or needs you may have. Holy Spirit Prep is proud to announce the House Leadership for the 2018-19 school year. The Office of College Counseling is conducting an 8-10 question survey of our community's college network. Help us prepare our graduates for post-secondary life by answering a few questions! Come out to the school-wide Art Show on Wednesday, May 16 held in the Lower School cafeteria! All parents, students, teachers, and staff are invited to the opening at 4pm to browse the collection while enjoying light refreshments. Explore the diverse collection of art mediums including acrylic paintings, ceramic sculptures, and art made from recycled materials. Each Lower School student will have at least two pieces of artwork on display, and there will also be some featured art from the Upper School and Preschool students. This show will only be up for a limited time, so don't miss your chance to see what our students have been working on all year! 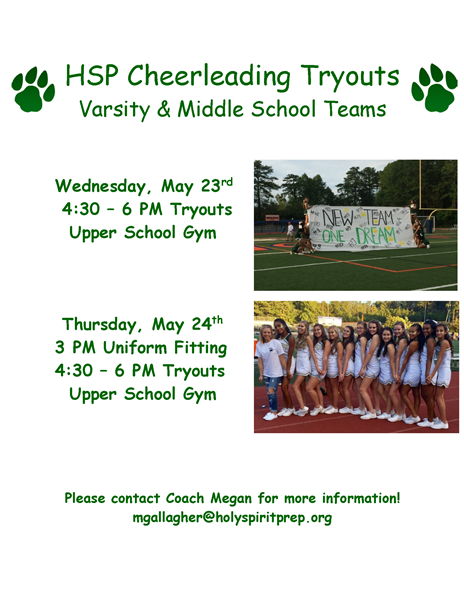 Registration for HSP summer camps is now open! We have passed the initial deadline for registration, May 1, so some camps may be closed. Holy Spirit Prep offers summer camps for students age 2-18. 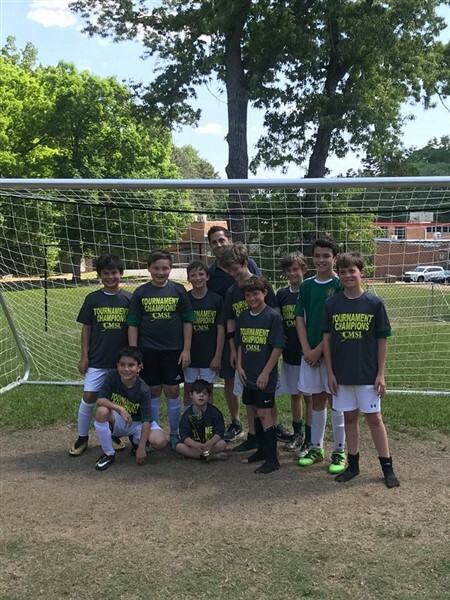 Congratulations to both our U10 girls and U12 boys soccer teams for winning the CMSL championship tournament held on May 5-6 at St. Jude the Apostle Catholic School. The girls went undefeated in the regular season. In the tournament, they played two games. In their first game (semi-final), they were missing two key players that brought them down to five players. We play six vs. six at this age, so we called two second graders to play with us. In the semi-final game, the girls went down 1-0 in the first half, when their opponents scored on a penalty kick. In the second half, Presley Kate Cunningham scored, sending us into overtime. In overtime, Emma Shurman scored the winning goal. 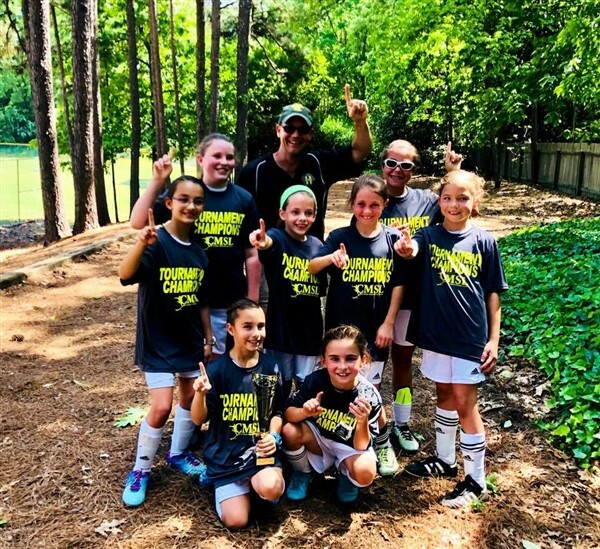 In the tournament championship game, the girls were missing two key players again, so we had two guest players with the team again. In the championship game, Madelyn Neff was on fire, scoring four goals. Emma Shurman scored one goal as well, and the team cruised through the game, winning 5-1. Summer reading and assignments are posted below and online at www.holyspiritprep.org/summerreading for students in grades K-7. At this week's All-School Mass, and in an email to parents from Mr. Pietrantonio, we announced that Regnum Christi has tapped Miss Eckert for a new mission assignment, and that this school year will mark the end of her time with us. So we can give Miss Eckert a proper send-off, the Lower School will host an open house next Thursday, May 24, from 1:00-3:00pm. Come by to say farewell and let her know how much she has meant to you! What is the "Pilgrim Queen of the Family"? The tradition consists of a traveling image of Our Lady visiting one home at a time, so that family receives many blessings when they get together to pray. As we all know, there are many ways to pray and bring our hearts closer to Jesus, and one of them is the Rosary. The image of Our Lady comes with a Rosary, and a booklet that explains how to pray the Rosary, that have all been blessed at the Basilica of Guadalupe. At the end of a school Rosary (the last one this year is May 22), the image of Our Lady will visit and bless a family, and after the following school Rosary, it will come back to the school and visit a different family, thus creating a community of faith and continuous prayer. There are four Pilgrim Queens of the Family at HSP, so four families can be visited simultaneously. In order to better serve our students, we have made some changes to the way we will administer final exams. Our desire and intention is to have a schedule that is efficient and gives the best opportunity for success, minimizing distractions and unproductive free time. If your student tests with accommodations, you will receive a separate email with information only pertinent to students with accommodations. Exams will be administered by subject, instead of by period. Each exam will last 1.5 hours. There will be 20 minutes in between exams. Junior high exams count as a regular test grade and will include material from only the last quarter (since March). High school exams count as 20% of the final semester grade. Students need to wear regular uniform for all exams. During exams, students will be required to leave their bags in the front of the classroom. No bags, books, or unnecessary materials will be allowed at desks during the exam. Students are invited to leave their belongings at home if they don’t need it during exam time. Students need to bring a snack to eat in between exams. The school will not provide a snack during exams. Teachers will collect cell phones in a basket before each exam to minimize distractions (labeled by student to prevent confusion when phones are redistributed). Teachers will be limiting students’ trips to the restroom during exams. Students will be offered the option of going to the restroom before teachers hand them the exam. Students are to remain in the classrooms until the end of the exam time. No student or group will be dismissed early. During exams week, lunch will be served daily to all students. At the end of the second exam, 11:40am, students should proceed to the dining hall. Based on student and teacher feedback, afternoon tutorials during exam weeks have been discontinued. Teachers will still be in their classrooms until 4:00pm and available to assist students seeking additional help. Students are to be picked up at 12:30pm during exams. Please know that we will not have supervision for students that remain on campus after 12:30pm. Winning House Day – HSP spirit wear. Only the winning House comes to school this day. Finally, the PVA will be collecting books for the Used Books Sale. Please ask your student to put their used books in the boxes located in the Rotunda of the Liberal Arts building the last day of school or after their last final exam. On Wednesday, May 30, any books or uniform items left in the lockers, locker room or around school will be donated to the Used Books and Uniforms Sale. Please do not hesitate to contact me for questions. We are so close to the end of the year. Please encourage your student to finish the year strong. Summer reading and AP assignments are posted below and online at www.holyspiritprep.org/summerreading for students in grades 8-12. 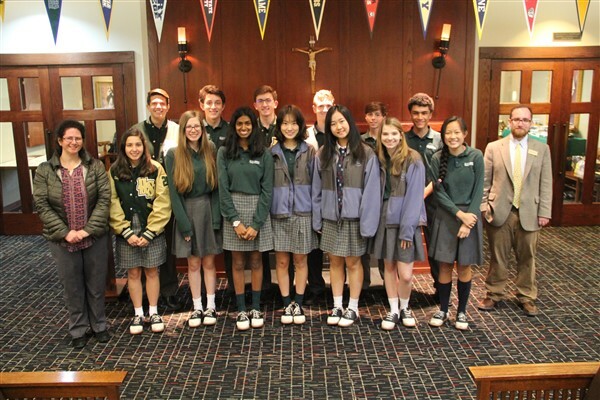 At the end of February, all Holy Spirit Prep Greek students took the 2018 National Greek Exam, administered by the American Classical League. A total of 161 schools participated, including schools from Spain, China, the United Kingdom, Canada, Italy, and Taiwan. Every Holy Spirit student scored significantly higher than the international average for their level of exam. Congratulations to the following students for their impressive showing! Congratulations to the following Spanish students who attained national recognition for excellent performance on the 2018 National Spanish Examinations. The National Spanish Examinations are administered each year in grades 9 through 12, and are sponsored by AATSP. Students are placed in bilingual and non-bilingual categories along with their corresponding levels. They were invited to a luncheon in their honor held on Monday, April 23 in the Board Room. The PVA Book Sale will be held on June 1, 4, and 5, 11:00am-2:00pm each day. SHOP ONE DAY EARLY, on May 31,WHEN YOU SIGN UP & WORK THREE HOURS or more helping with our PVA Used Textbook Sale. This is the same date on which faculty and staff will be invited to shop early. This sale is for books only-uniforms will be collected at the same time as books, but uniforms will not be sold until later in the summer (because students tend to grow a lot over summer). The Used Textbook Sale is a fundraiser for the Upper School PVA and pays for monthly birthday celebrations and gifts for teachers, decorations for dances and ROMA, and provides support for All School events like the Father Daughter dance. QUESTIONS? Email Ann at Devine Family devinefamilymail@gmail.com or call 770-296-1930. "Overcoming Challenges with Faith and Courage!" A philosopher once said, "Be kind, for everyone you meet is fighting a hard battle." All of us face challenges in our lives--big and small. The story of Nehemiah is the story of how one man facing overwhelming challenges on behalf of his land and his people triumphs through his faithful obedience and reliance on God. Just as Nehemiah was called to an important task by God to help protect Israel, God calls each one of us to important tasks, both as leaders and followers. God didn't leave His people defenseless and He doesn’t want to leave us defenseless either. He wants to protect us. No problem is too big, and no burden too heavy for Him. Our Lord invites us to trust Him and depend on Him, and know that He is always with us. Please join with us as we learn about Nehemiah and let his example inspire us with renewed courage and spiritual tools to persevere and overcome the challenges we face. Calling all teens! Come earn your service hours this summer as you work with and inspire kids to grow in our Catholic Faith. Rising 7th through 12th graders are invited to volunteer. Volunteers will wear multiple hats: creative, nurturing, athletic, leadership. Whatever your talent or interest, there is a place during VBS to serve. Volunteers must attend one planning meeting prior to the week of VBS (time and date TBA), and must be available the entire week of July 9-13, from 8:30 a.m. to 12:30 p.m. Service hours and recommendations will be given. For more information or to volunteer, register online at www.hspccatl.com or contact Heather Kerutis at hkerutis@hsccatl.com.